www.photomacrography.net :: View topic - FAQ: What's the best way to step focus when stacking? FAQ: What's the best way to step focus when stacking? Posted: Mon May 04, 2009 4:36 pm Post subject: FAQ: What's the best way to step focus when stacking? When I'm shooting a stack, what's the best way to step focus? Should I turn the focus ring, or use a focus rail or slide? Does it matter if I move the subject instead of the camera? If my lens is on a bellows, there are even more options. So many choices -- what's best?? Don't agonize over the decision. It usually doesn't matter much. Use the longest lens that's convenient and gives you the resolution and field of view you want. Use the focus ring if you can make fine enough movements. Otherwise use a focus rail to change the subject-to-lens distance, leaving the lens set at a fixed focus. At higher magnifications, you'll need something like a screw driven table or a microscope stage. These recommendations cover most common uses of stacking. There are some fine points that matter for unusual cases. For example, if you want to stitch several stacks to get a wider field of view at very high resolution, then you may have troubles with parallax error caused by different stacks having different perspective. See the threads about telecentric optics and a rotating head (two very different techniques) for some suggestions of how to deal with those situations. If you want to shoot very deep wide angle stacks, see "Macro landscape stack..." and the links therein. Other options and issues are discussed in "Stacking, starting from the ground". If you're happy with just accepting the recommendations, then stop reading now and skip to later posts in this thread that will show you how to put hardware together. To understand the recommendations, it's easiest to start with a bit of theory. Stop down your lens, look into the front of it, and you'll see the diaphragm that forms the aperture. The apparent position and size of that aperture is called the "entrance pupil". The entrance pupil is usually somewhere around the middle of the lens, but depending on lens design it can be nearer the front or farther back, even behind the camera in rare cases. The center of the entrance pupil is also the center of perspective for each frame in your stack. You want perspective to change as little as possible between front and rear of the stack. With simple subjects, this is not a big issue. But if your subject has parts that overlap each other, then changing the perspective can change the overlap. If the change is too big, it can produce defects in the stacked image. Roughly speaking, the change in perspective depends on the distance the entrance pupil moves while focusing, divided by the total distance from entrance pupil to subject. A small movement combined with a large distance is good. Using a longer lens increases the distance. The other recommendations are a tradeoff between minimizing movement of the entrance pupil and getting fine uniform focus steps. Ideally, the entrance pupil would not move at all. However, this usually requires strange setups that have other drawbacks. Option 1) Change the lens extension or focus ring while leaving the camera and subject in fixed positions. Option 2) Leave the lens extension fixed while moving the camera and lens as a unit (or equivalently, move the subject). At low magnifications, say you're shooting a bouquet of flowers, Option 1 results in least movement of the entrance pupil, and it's also very practical. At higher magnifications, turning the focus ring may still be the best thing to do in theory, but in practice your DOF per frame may become so shallow that you can't turn the ring the proper amount. At that point you have to switch strategies and use something that can make smaller and more repeatable steps. A focus rail works OK for modest magnifications where DOF per frame is more than 1 mm or so. At higher magnifications, DOF per frame will drop to a small fraction of 1 mm, at which point you need to switch to something like a screw driven table or even a microscope stage. Posted: Tue May 05, 2009 12:45 am Post subject: Re: FAQ: What's the best way to focus when stacking? You want perspective to change as little as possible between front and rear of the stack. As a non-stacking film user, the above caught my eye. Perhaps is is a matter of what we understand by perspective but I would have thought that some change of perspective between the front and rear of the subject was desirable, being the norm in any image, just as two such views, laterally spaced, are required for functional stereo pairs. There are many aspects to perspective. What is important for stacking is only the aspect of how things line up, foreground versus background. This is determined by the location of the entrance pupil. I suspect you are thinking of other aspects, such as distant objects look smaller. Those aspects do not matter for stacking, as long as foreground & background features stay lined up the same in all frames. Aside: Followers of this FAQ topic will notice that I have cleaned it up, deleting several posts related to the concept of FAQs in general, as opposed to shooting a focus stack. Thanks Rik. I'm using the motorised focus system from http://www.saphicon.com - it's a bit expensive, but a very high quality piece of precision equipment that is pretty easy to setup, with software that automates the process of capturing a z-stack of images. It allows you to set a range of parameters, such as top start point, bottom end point, step size, and delays for firing the shutter so the rail can settle if need be... It triggers the Canon EOS utility so it's perfect for using with live view focussing, etc... I'm very happy with it so far and it's made life a whole lot easier. Now all I need to do is work on my lighting, parameters to set in the software, retouching skills and I'm in business! It would be nice to have a collection of pointers to stacking rigs of all kinds: typical, innovative, automated, manual, sophisticated, simple, really simple, etc. Can people please contribute their favorite links to this thread? My most commonly used rig is HERE. A shot of the same rig equipped with a microscope objective can be seen HERE. That picture is a little bit out of date. The holding and movement mechanisms are the same now, but I moved the illuminator stand to a separate support for convenience and and to isolate any vibration from the illuminator fan. Also I removed that backlighting tube because it never worked very well -- too difficult to balance colors with independent lights. Edit: to show version with microscope objective. My current setup for documenting dead bugs. Both the focus block and the bellows are mounted on a long RRS rail. Sufficient space beneath the foam diffuser for a slave flash. Hmm, I'm surprised you don't get vibration problems. Only the one flash unit. You've shown eg 3 heads in use together before. Do you find you get all the diffusuion you want, with just one? Setup is on a table on a concrete basement that was poured onto a solid rock foundation (great location for this kind of photography but pretty lousy for gardening - no topsoil to speak of). This setup is for low mag imaging of horse flies, single flash works fine. I always have the option to use a slave beneath the diffuser if the ventral shadow is bad. Or can position SB-R200 flashes on blocks either side of the diffuser. 4 SB-R200 flashes are most convenient for high mag work using the vertical microscope setup where I can rest them on the enlarged microscope stage. Posted: Sun Feb 07, 2010 11:49 pm Post subject: List of links in FAQ: What's the best way to focus? Charles Krebs: Tabletop "macro" setup. Many contributors, covering Nikon, Olympus, Meiji, Swift Focus Blocks & Setups. Chris S: "Bratcam" (focus blocks and goniometers). Magnetic lighting stage HERE. 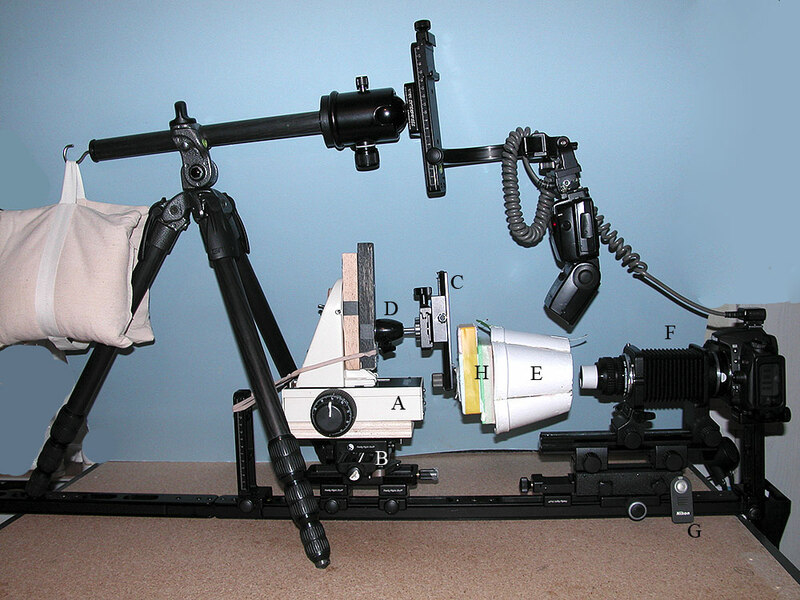 seta666: linear stage with micrometer drive, mounted on mini tripod. For part numbers, visit the Flickr link and hover over parts of the image. Pau: vertical macro setup, using salvaged microscope for fine focus. januszj: horizontal setup, using microscope base including the stage for focus and specimen holding. Tomatito: horizontal setup using Lego blocks for structure (see HERE, images 5-6) and Proxxon precision vise (HERE, image 2) for subject movement. Keks: an "all directions" setup using the StackShot, HERE. Marc Iwaniec, Thorlabs stages and goniometers, HERE. John Hallmén: simple off-the-shelf stacking setup using Proxxon screw table, HERE. naturephoto1: studio macro rig with goniometers, focus block, and screw rail, HERE. Hokan: a Velmex rig, HERE. soldevilla, DIY screw-driven stage, HERE, with alternate sliding design later in the same thread, HERE. daemonoropsis, StackShot mounted on Arca/Swiss rails & breadboard, HERE, with 2nd generation follow-up HERE. ecooper, Laboval 4 microscope body lying on its back, HERE. seta666, new setup using motor driven micrometric linear stage, HERE. michael_r's "modular camera system for photomacrography", HERE. Miljenko, "Another low cost studio setup", HERE. Kurt Wirz, ultra-fine focus stepping via thermal expansion of a plastic tube, HERE. The posting is in German; automatic translation by Google is readable. GemBro, microscope column plus bellows and Ikea LEDs, on breadboard with Arca-Swiss fastenings, HERE. steveminchington, optical breadboard with assorted surplus slides and stages, HERE. Kieran Jones, compact setup using Thorlabs breadboard with StackShot on column, scissors jack specimen holder, HERE. Sharks (Can Tunçer), tabletop setup using WeMacro rail, infinity objectives with Raynox DCR-150 tube lens, 2-axis rail as specimen holder, HERE. keks "Versatile macro rig", able to shoot horizontal, vertical, or any intermediate angle, with an assortment of bellows and tubes arrangements, HERE. Saul, "Most recent field auto/manual setup with Deltron stage and WeMacro control unit ", HERE. nanometer's camera support clamped to microscope top standard, HERE. Adalbert, tube lens setup built with M42 tubes on Arca rail using Harley clamps, HERE. Saul, Componon - microscope turret combo with DIY adapter rings, HERE. Ray Parkhurst, vertical rail system using an "idler rail" for improved stability, http://www.photomacrography.net/forum/viewtopic.php?t=37224]HERE. etalon's magnetic clamp base, with monopod tilthead holding coarse and fine linear rails, HERE. Edited May 2, 2010, to add some more links. Edited July 7, 2010, to add some more links. Edited Sept 9, 2010, to add some more links. Edited Nov 17, 2010, to add some more links. Edited March 13 & 29, 2011, to add some more links. Edited May 16, 2011, to add some more links. Edited January 12-14, 2012, to add some more links. Lots of capability in a moderately priced device that you can just buy and use -- no fiddling required! This post is mostly to "bump" this thread, to put it back on the first page of FAQs. I have recently added several new systems to the long list at http://www.photomacrography.net/forum/viewtopic.php?p=55311#55311 . Please let me know if I have missed any that you'd like to have indexed.